Down in the garden, where the toadstools grow, there’s a little mushroom just waiting to make friends. 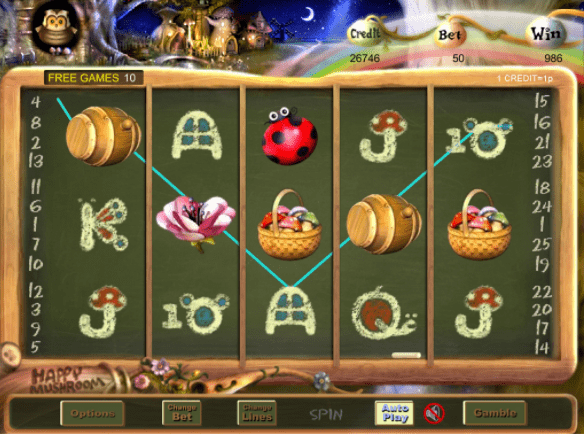 Encounter a world of fairies and ladybirds and connect the dots to achieve lovely rewards in this authentic undergrowth 5 reel online slot experience when you check out slots here. Brisbane Australia’s own signature game developer Eyecon is known not only for its deep-rooted passion for creating unforgettable online experiences, but also ways in which to also push themselves forward within an industry that has thousands upon thousands of titles and stand out here at Wizard Slots online casino. Mushrooms are like marmite to some people, some love it and some hate it but if there is one thing they can all agree on is just how darn happy they look. This is even clearer when you play Eyecon’s Happy Mushroom online slot. What makes this game unique is a mixture of theme and gameplay with a very nice player return value set at 95.06 per spin! Very good odds indeed. The art style of Happy Mushrooms is there to elicit a response, what that response depends on what you find funny and what you find annoying. The mushrooms are quite cute to look at but can put off those who just want to play a straightforward slot. In other words no grumpy gits. There's no question why this made it to top-rated slot games online list! Thanks to the look of this game you will find symbols that take the shape of something a little offbeat. In most games the letters of certain symbols are of a certain style, here the symbols are all an eclectic mix of carrots worms and other garden-related symbols. The other symbols are probably even more fun. The owl symbol will move about even when the game is inactive (he will also hoot when 3/2 or more are on screen), the mushroom has an unusually wide smile on its face, the ladybird looks like it is waving and the basket containing, even more, whacked out colours. Most players favourite will probably be the little white bunny holding a carrot, though there’s also a wooden barrel that just screams for attention. Then finally there is a rather beautiful pink rose which rotates throughout the game. Music plays a big part in Happy Mushroom, which gets increasingly brighter every time you win. The background continues to keep with the fantasy tone with windmills and rather majestic trees lighting the path to riches. Players can play for as little as 1p which can be adjusted to any number up until 25 depending on the player. Keep your eyes open for the funky mushroom, this little guy is the games scatter. If you get 3 scattered mushrooms within the 5 reels, you will earn a special bonus! What that bonus is depended entirely on the number of symbols you are matching on the right reels, the more you play the higher the chances, remember that. 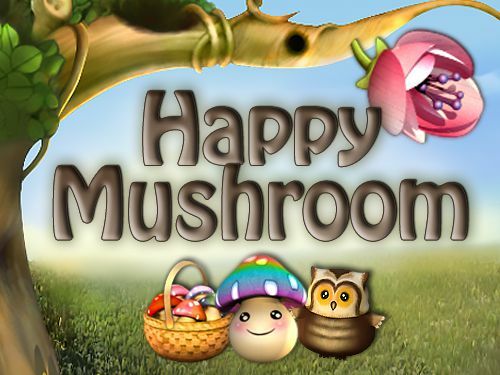 Happy Mushroom: a great game with a great theme that is sure to waist a good afternoon.